In a small bowl, dissolve the gelatin in 3 tablespoons warm water. Add the Cointreau. Zest 2 – 3 tangerines, then peel all of the tangerines and juice them. Add the gelatin mixture, sugar, tangerine zest, lemon juice and tangerine juice to the egg yolks and mix well, using a wire whisk. 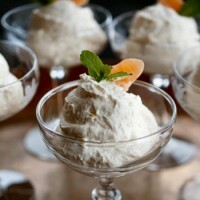 Spoon the mousse into individual serving dishes. (I used my ice cream scoops.) Chill for at least 4 hours or overnight. Garnish with mint and a slice of tangerine.